After the holiday high always comes the winter woes and this Friday, January 18th is shaping up to be awfully woeful; with a forecasted low temperature near freezing and nary a holiday party in sight, the day promises to be extra boring for parents and their children. That is, of course, except for parents and children who plan to attend the Fort Thomas MOMS Club Kids and Family Expo at the Fort Thomas Community Center (Mess Hall). This event was originally scheduled for last week. Moms Offering Moms Support (MOMS) Club is an international organization of support groups for stay-at-home mothers. The local chapter, the Fort Thomas MOMS Club, provides dozens of young and experienced mothers alike with support, lifelong friendship, and the proverbial “village” it takes to raise a child. 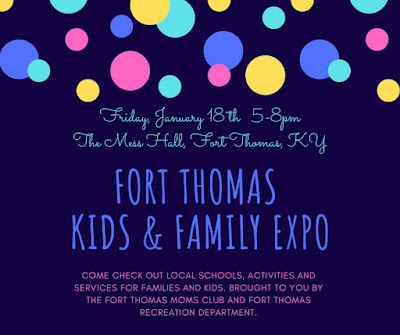 The second annual Fort Thomas Kids & Family Expo goes from 10:00 a.m. to 1:00 p.m. There, you'll find animals and activities for the kids while parents can explore local schools and businesses. Admission is free. Vendors and some local businesses are donating some silent auction items with proceeds going directly to The CARE Closet.